I never fail to be astounded by how much some lovely food can cheer me up. 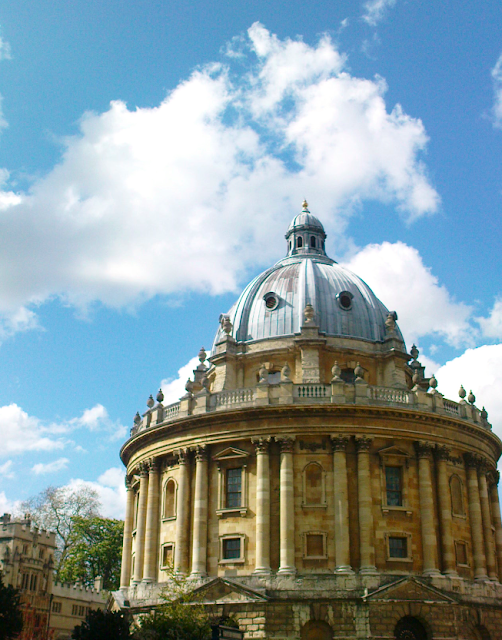 This morning had been terrible and by the time I had dragged myself (in my lovely new white ballet pumps...) to the Rad Cam to do some work (the rather lovely building below, an epicenter of tourist-density, though luckily only students are allowed in - but trust me, it's just as beautiful inside! We're very lucky) I was feeling a bit sorry for myself - perhaps a little spoilt, but what can you do. 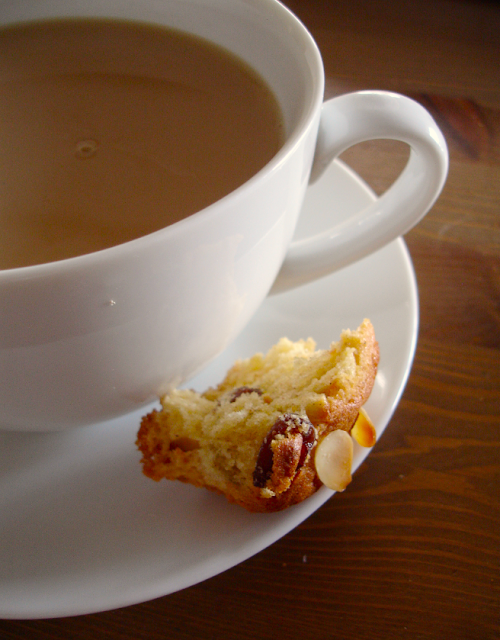 I managed a few hours until closing time - and most importantly, tea time - beckoned. Instead of dragging my rather grumpy self back to college I decided to take a detour to my second favourite patisserie in Oxford - Patisserie Valerie - and grab something to cheer myself up. As I can't bake it myself, might as well indulge in the ready-made. 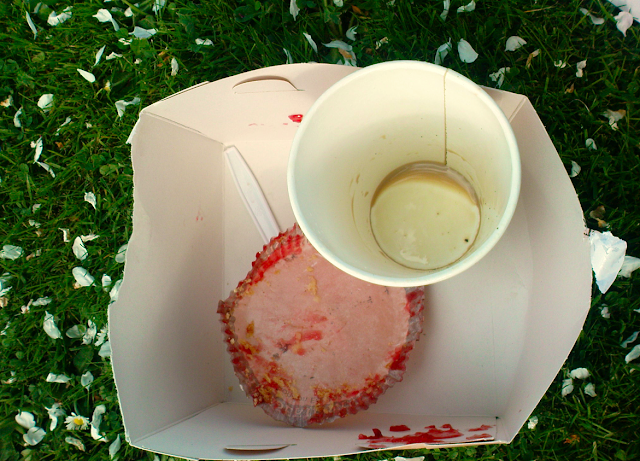 I went for a rather beautiful little raspberry tart and a latte - classic combination, as far as I'm concerned. I was rather tempted by some almond croissants, and ice cream (I'm always tempted by ice cream! 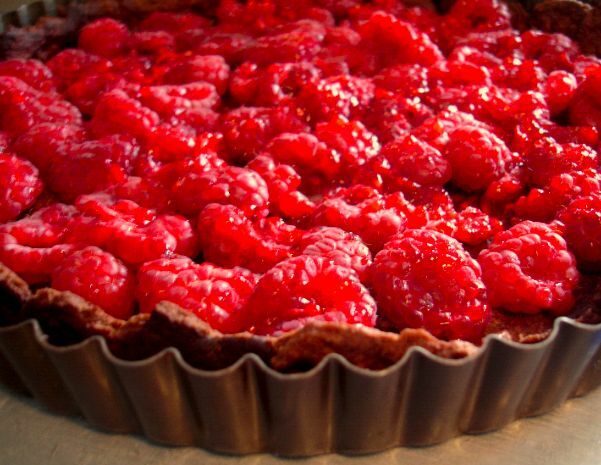 ), but the tart was just so ruby-red and sort of... called to me. 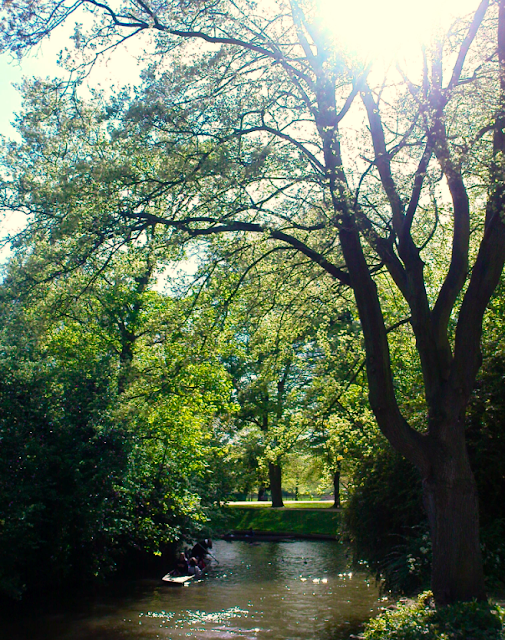 I walked down to the wonderful Botanic Gardens down by the river with my tart in one of those exciting little pastry boxes, sipping my latte as I went. As students of the university we get free entry to the Botanic Gardens and it's a bit of a haven for me - even when quite full of people like today, it's an incredibly soothing place away from the melee of Oxford. The rose garden outside is very special to me too - not only because I really love roses - but because it's dedicated to my grandfather, among others. So I always make a little detour to read the plaque and have a wander. 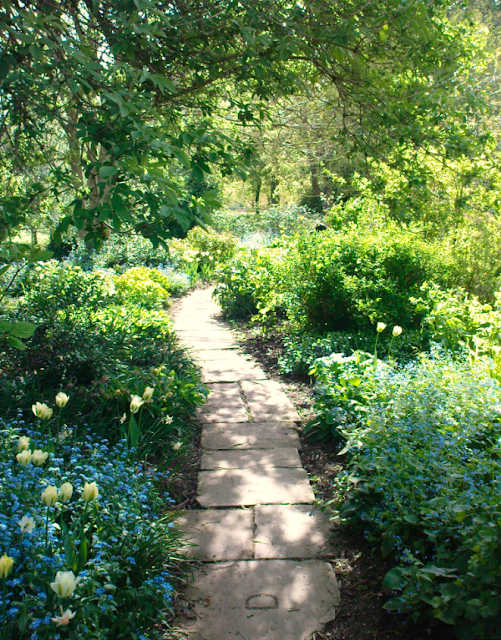 I can't wait till the roses are out, I've never been in Oxford when they've been blooming. 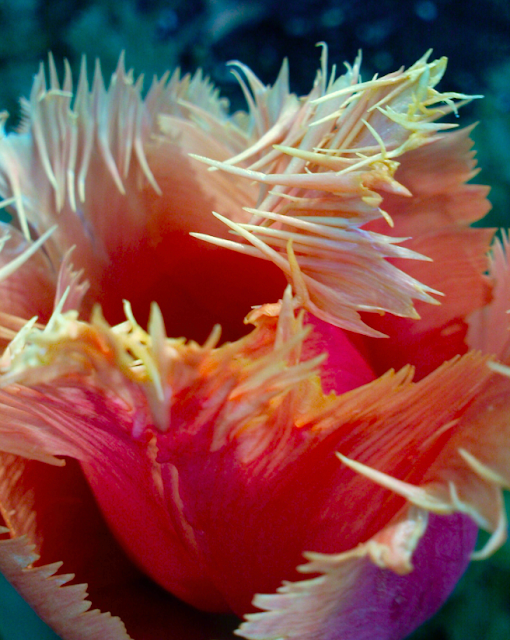 I really love the mixture of crazy plants and more 'normal' everyday plants in the gardens themselves, like the extravagant and normal tulips below. 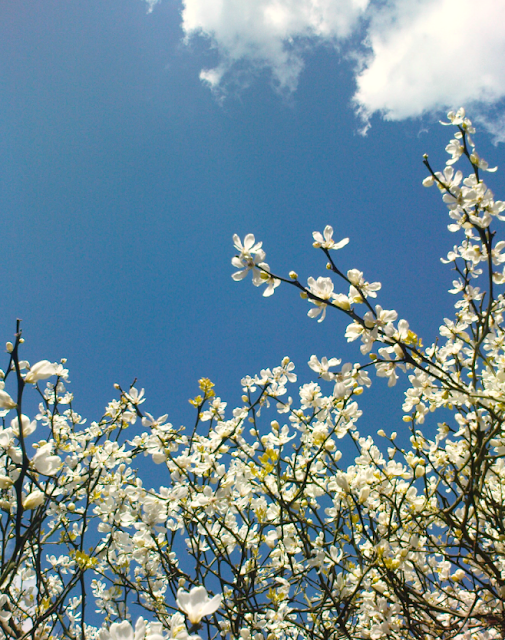 Spring has really hit in the gardens - it's blossoming and flowering and bursting out with new leaves all over the place. I only had my phone with me, so the photos aren't perhaps as good as they could be - but I'm pretty impressed with how it held up. 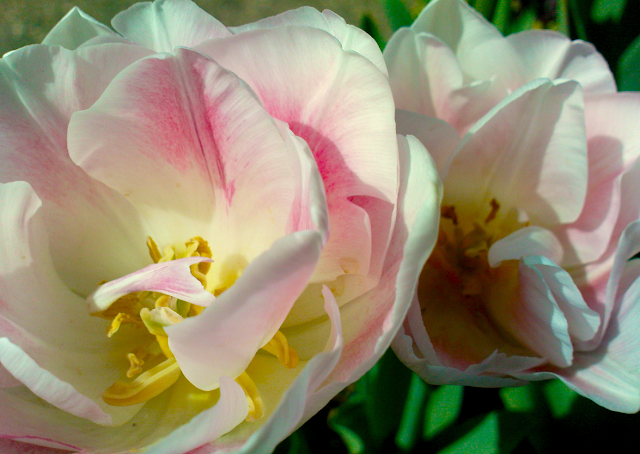 There really is something about spring - it feels so hopeful and promising, like nothing could really be wrong with the world, or stressful - just growth. Wandering around among the children running about laughing, the groups of friends gossiping, people punting on the river, couples sitting on the grass, people studying in the dappled shade of the trees, the elderly sitting on benches, quiet and unassuming watching us all go by, it really feels as though life could only be good. I sat down on the petal-strewn grass under one of the blossoming apple trees to attack my tart - the coffee was rather depleted by the time I had wandered about taking photos and daydreaming. It had been squished a little - you can see a little jelly smeared on the box at the bottom, but it was fine. It was wonderful. Lovely crisp pastry, a thin layer of dark chocolate, a slither of cake, smooth crème pâtissière, good fresh raspberries and a thin coating of jelly. 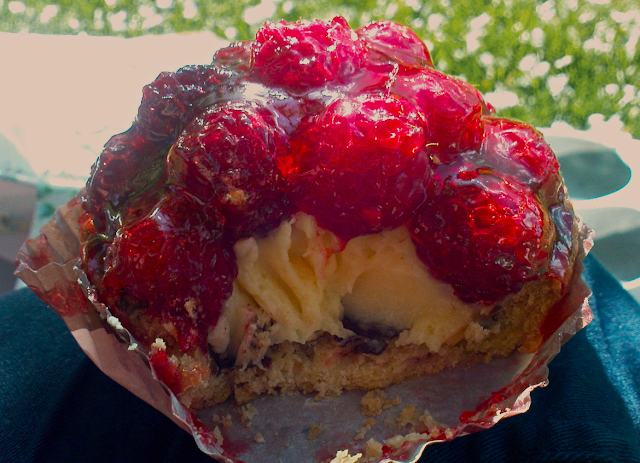 We have a raspberry tart at a bakery in Switzerland that does similarly divine raspberry tarts - though theirs has alcohol in the cake, and a whipped cream layer and the pastry is flaky, rather than a case. I haven't made a raspberry tart like this for ages - must remember this summer - but we did make a wonderful strawberry one last summer. We had heaps of thick crème pâtissière in a pastry base simply topped with a punnet of strawberries from the garden - bliss. 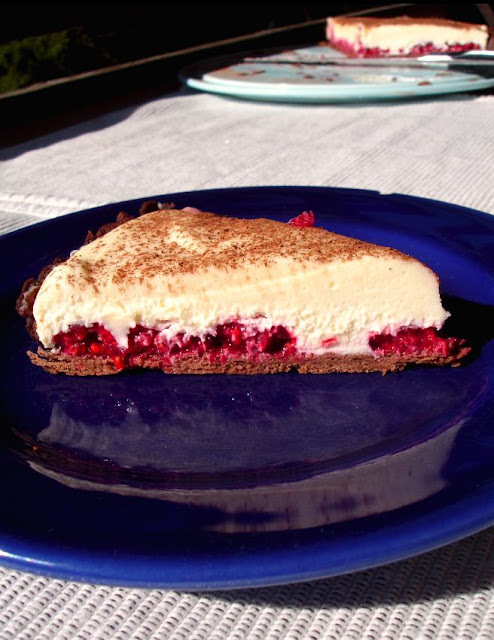 I suppose the White Chocolate and Raspberry Tart with a Dark Chocolate Crust I made a while ago counts, but it's different - less of the creamy, egg yolk thick custard. It feels very odd not having a recipe to offer, but as I can't be baking it does feel good to at least think and write about food - I really do miss it here. 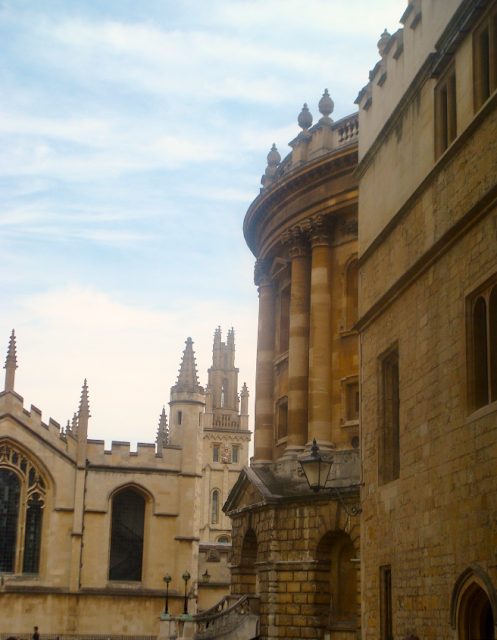 I got back to Oxford on Tuesday, so am now dislocated from my kitchen. 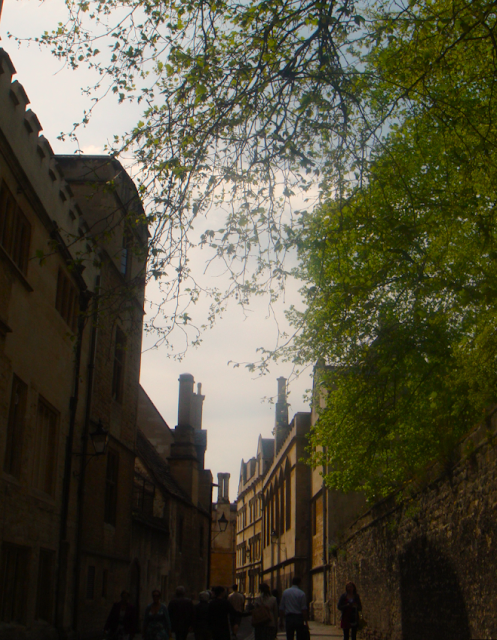 It's beautiful weather here, and Oxford looks beautiful in it (it always does, but sunshine transforms the sandstone) - though it's now thronging with tourists but I don't blame them, it's gorgeous. Unfortunately I didn't take any photos when it was really stunning. 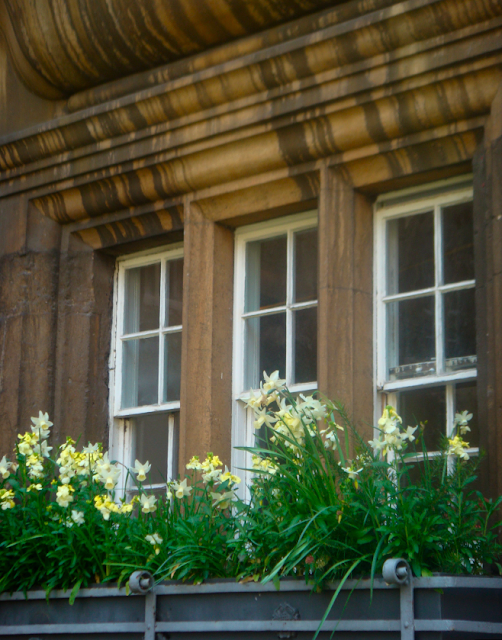 Luckily my college isn't one of the big big ones, like Christ Church, that has tourists coming round and prying into every nook and cranny of our lives - though I do have friends who have people peering into their bedrooms and even coming in sometimes! I know we live in a beautiful place, but it's a working place our privacy is important too... though I would deal with that if I could have a kitchen! At least this is my last term - last eight weeks - before we get a kitchen in our flats. I made these cupcakes at the beginning of the holiday when mum had bought a bumper amount of blood oranges - mum always squeezes oranges on the magimix before breakfast, and loves to add some blood oranges or grapefruit to add a little interest - though there's nothing better than a batch of really good sweet oranges. I swear it's given me funny blood sugar patterns though - from an early age I had that big sugar rush of about 3 squeezed oranges within half an hour of waking up and now I feel quite ill if I don't have it/something else soon after getting up! 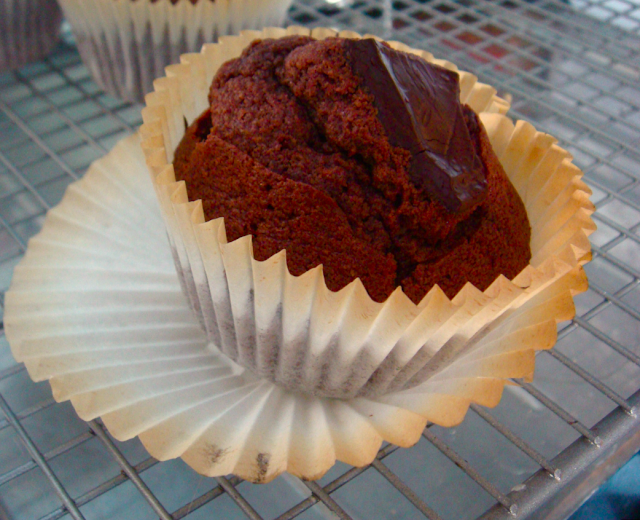 Anyway, I decided to see what happened if I made a chocolate orange style cupcake with them. 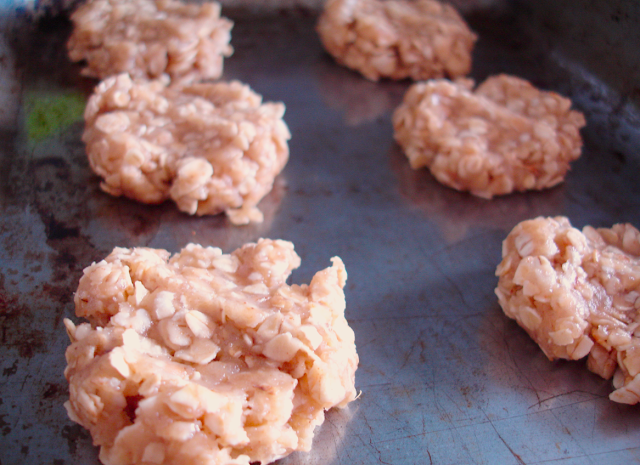 I didn't really use a recipe - just played about and they came out really nicely. 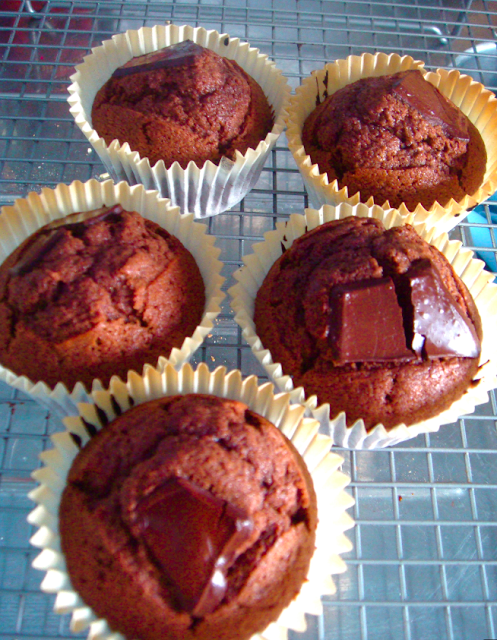 I don't really like lots of icing on cupcakes - sacrilege I know - so it's a nice compromise to add a square of nice chocolate to add another texture to an otherwise plain cupcake, even if it is full of flavour. 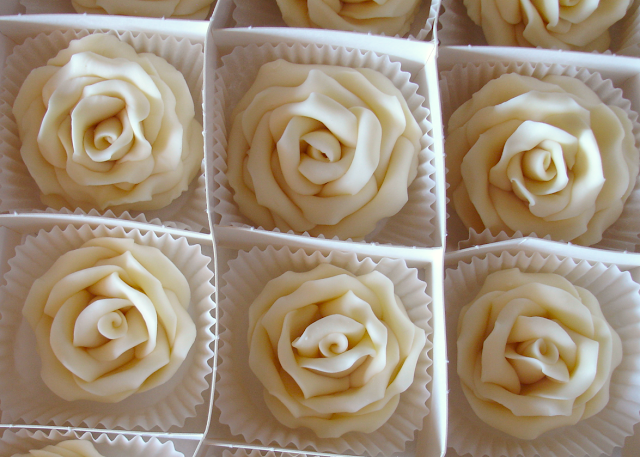 I could deal with a chocolate ganache on these, actually - it's mainly the pure sugar buttercream like ones I can't deal with. Edit: I've removed the recipe as I'm not happy with it and don't want you to try it and be disappointed. We had been serving up the remaining ganache from Mum's birthday cake just melted with some extra cream on fruit or with the cake offcuts and icecream. It's pretty damn tasty like that, but when it came to the fourth dinner party we were holding since the party (my poor student of a best friend needed feeding while staying in town so we thought we might as well feed everybody else too) I thought we should branch out and do something more exciting. 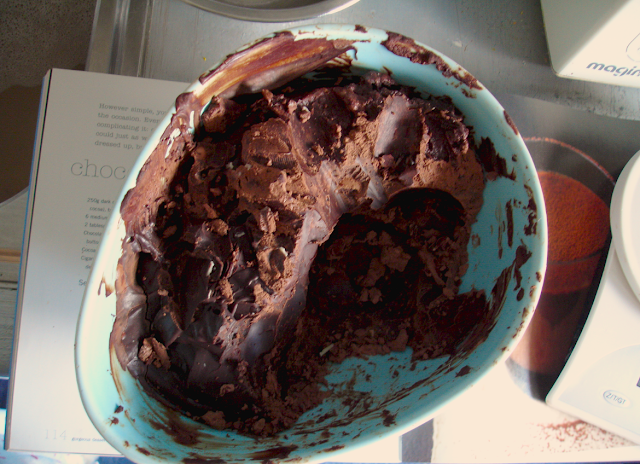 We still had well over a kilo of ganache that was solid in the fridge (as you can see below!) so I took a lump out for the dinner and froze the rest in chunks - I'd experimented with freezing it and then melting again with cream to make a lovely chocolate sauce etc a few days ago. As we were having three courses, with a big roast dinner with all the trimmings for main, we didn't want a great big filling pudding. I decided to go down the tiny-but-rich route and use shot glasses. 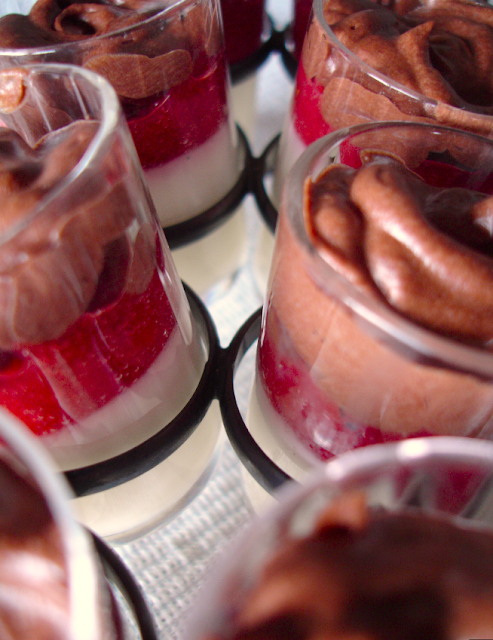 As I mentioned in my last post, I wanted to layer up some strawberry puree with something creamy and something with the ganache. 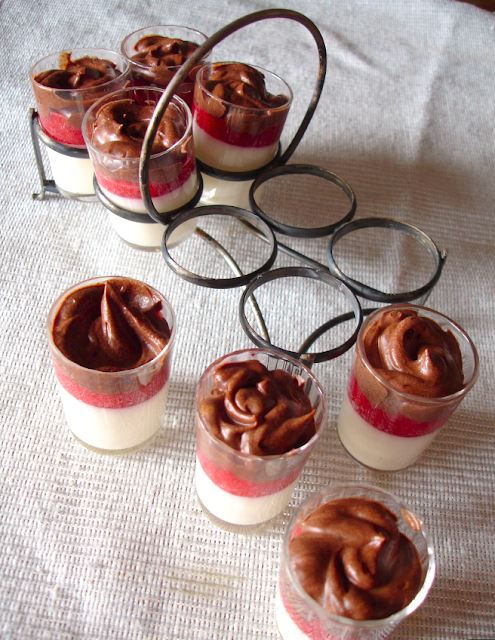 I deliberated for ages over what kind of creamy base to use - I thought of doing a baked custard, but then realised that the shot glasses wouldn't bake and I didn't want to use ramekins and not be able to see the layers. 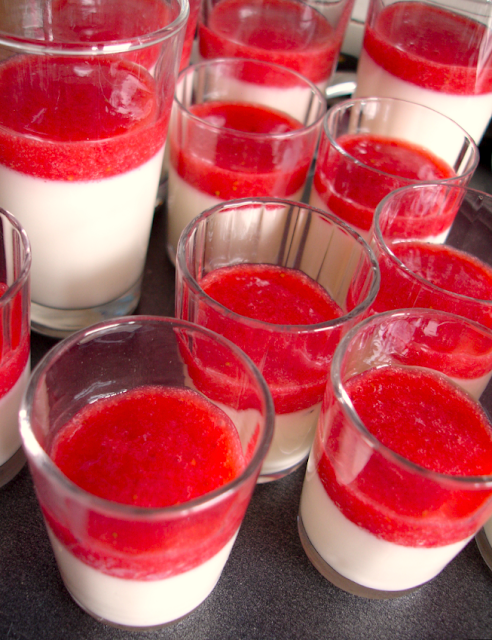 So I flicked through numerous recipe books and settled on a pannacotta - much lighter in the end, but creamy enough to set off the strawberries. So I improvised a milk/cream mix with the gelatine packet, Tartelette's Mango & Vanilla Bean Buttermilk Panna Cottas and a creme fraiche based panna cotta recipe I found. I made too much for my shot glasses, so filled a couple of ramekins for another day (just had one for lunch, in fact, topped with some leftover fruit salad - very lovely). I let it set for a few hours in the fridge, then popped it in the freezer briefly while I made the puree to try and make sure it didn't break when I poured the puree on. I piped the puree on, which wasn't really needed, but I bought a new bag and tip set the other day and wanted to play - and was being paranoid about getting it up the sides of the tiny shot glasses. 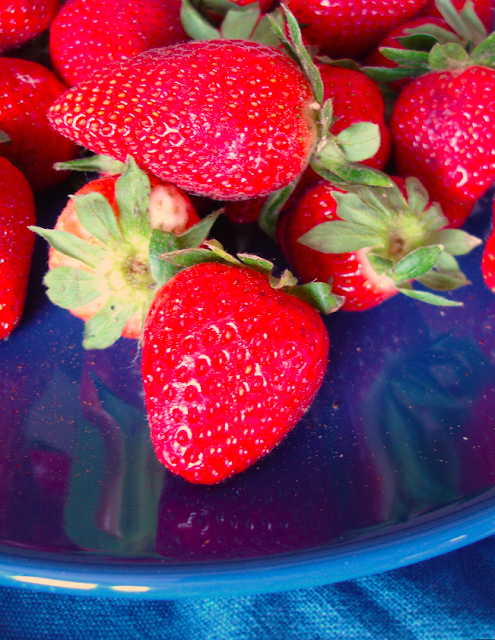 Had a bit of a disaster when I realised the strawberries had gone off since I had started dreaming of using them, and so had to pop out for more, which weren't as ripe and tasty as I would have liked. A bit of balsamic helped bringing the flavour out, though. After putting them in the freezer for an hour or so to solidfy the puree before I added the chocolate, I set about deciding what to do with the ganache. 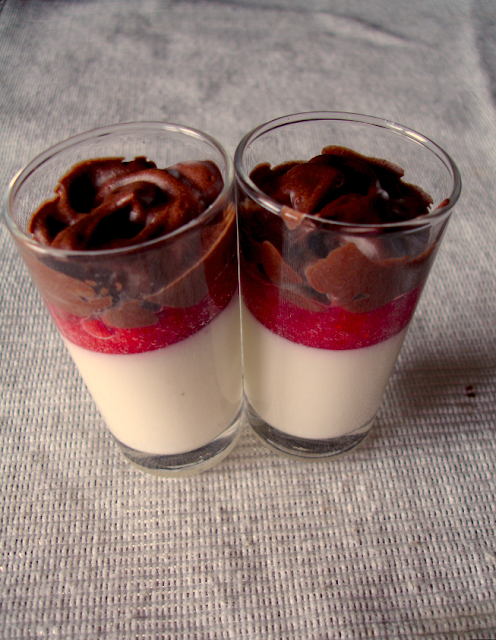 I wondered about trying to mix in yolks and then fold in whites to make a mousse, but it didn't quite feel...right. So I just whipped up the melted ganache with extra cream and piped that on. Another time I would do this closer to the time - we went out before dinner so it was in the fridge for a few hours - as it ended up a little too solid. It would still benefit from cooling down, though, just not enough to solidfy it that much - maybe more like half an hour. 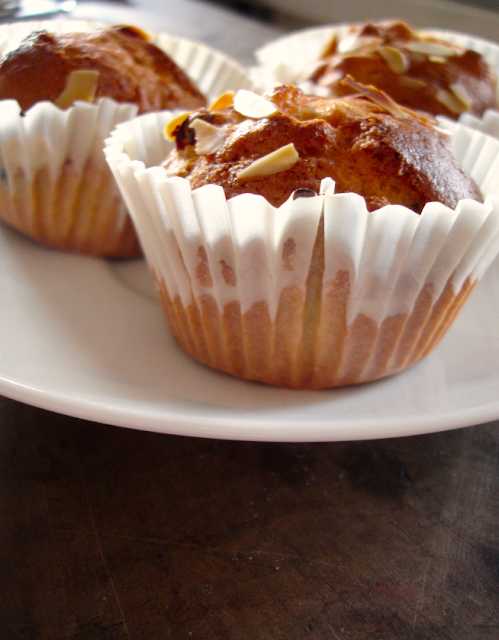 So in a rather pathetic attempt to get away from a weekend heaving with chocolate, I made some fruity muffins (well, you could also kind of call them cupcakes, but each to their own. I didn't want to make a heavy fruit cake like the traditional simnel cakes we used to make at Brownies, but something lighter. 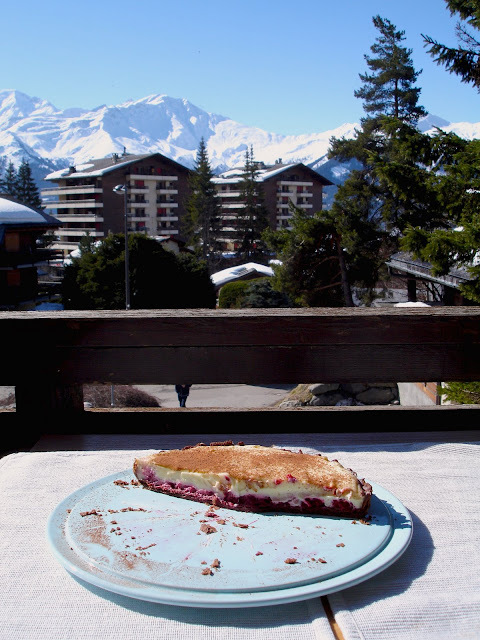 I started this yesterday, but ran out of time before a big closing party of my favourite apres ski bar - all I had done was start to heat the fruit with the zest and orange juice. This wasn't really a problem, as I just let the fruit seep overnight, which I should do but often lack the patience! I spent most of today translating Beowulf from the original Anglo-Saxon into modern English for my Old English paper at uni, and kept myself going with the prospect of making something lovely with the seeped fruit. Thankfully I managed to finish the translation and make these before going out to play squash. I didn't really have a recipe in mind, so I decided to play about and see what came out. 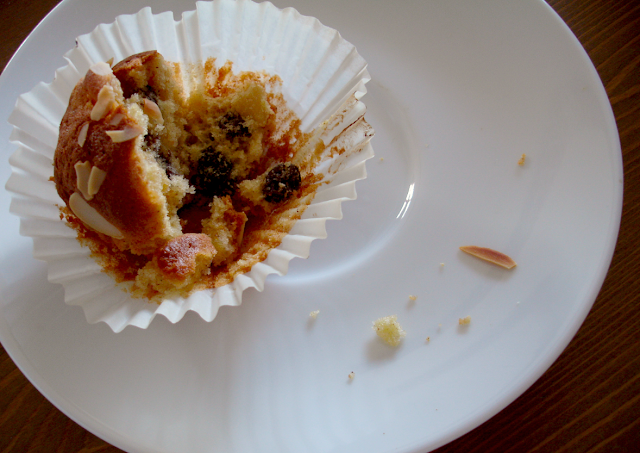 I used some lovely golden sultanas I had and some raisins for the fruit - currents and normal sultanas would be lovely too. I did think about using some dates, or glace cherries, but thought it might be too sweet. 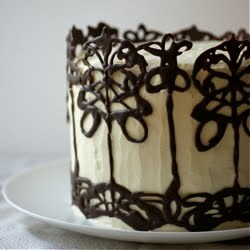 We have always made the same chocolate cake on birthdays - Mum even swears my Grandma made the same recipe for her. The only thing that changes is the toppings. So when it came to making another big cake for mum's birthday party I couldn't bring myself to change the cake itself, but decided to try a different topping/filling. Before we've often used a egg white based chocolate topping, creating a mousse-like filling (though it sometimes curdled a bit!) We sometimes added Mars bars to the mix when I was little. We've also played with the cocoa/hot chocolate powder ratio over the years - as I child I liked it with just hot chocolate powder. After making the white chocolate tart the other day I decided to play with the ganache-like mix with the creme fraiche, cream and white chocolate for the filling, and look at a normal dark chocolate ganache for the outside topping. 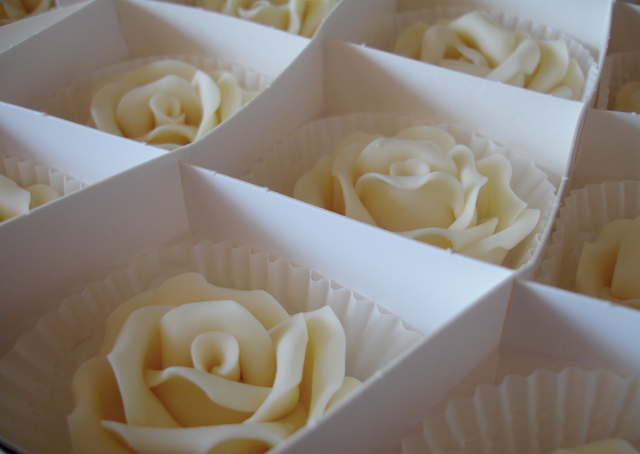 I bought some white chocolate roses from Squires to decorate it - the theme of the party is Black & White - so I wanted to contrast the dark chocolate with the white roses and some white chocolate buttons I had. Last year I made a similar size cake with just a hand electric whisk - was so lovely to have a big kenwood chef to do some of the work for me! 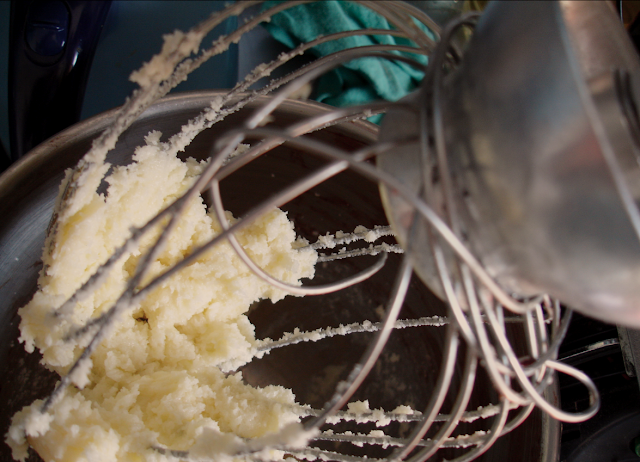 It always seems to make a lighter cake, too - that big whisk really does the job. Having said that, one of the spokes came off mine yesterday and so I had try and wind it around the top - hence the photo! Last years cake had the egg-white based topping and filling and was covered in raspberries - I really thought hard about including raspberries again, perhaps as a filling, but in the end it was expensive and I decided to keep it simple. 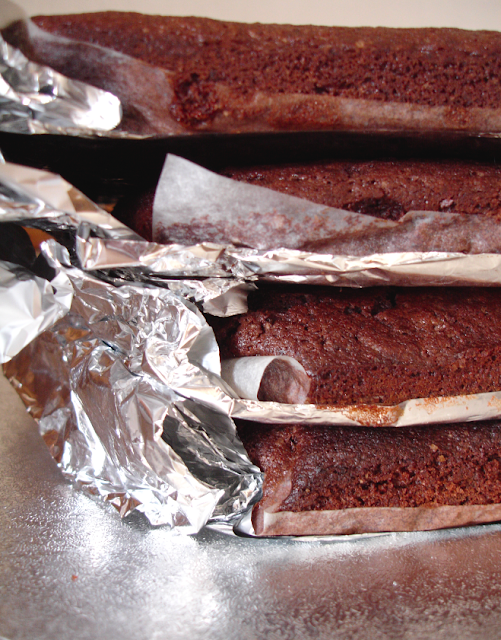 I got up early and started baking at 8am - I had decided to not bake any layers before the day, especially as I didn't have big tins or freezer space to keep them really fresh. So I just baked all day until 5pm - it was exhausting! I had four 'tiers' as such, though they were on top of each other - 8 layers of cake. The top was 8", then 10", 13" and 16" - it's bigger than it looks in the photos! As I don't have any circular tins bigger than 10", I had to do both the bottom layers as four batches of rectangles and then use templates to cut out each half and assemble it all. I used foil to try and reduce the waste by creating a more semi-circular tin. Overall I made 11 batches of cake mix! 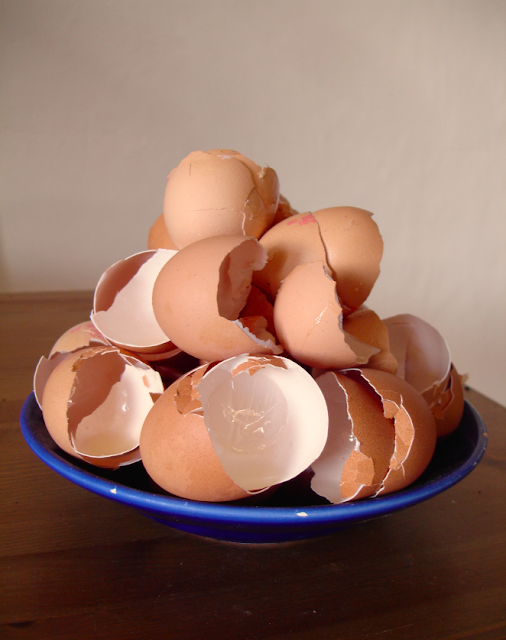 I used a 2 egg mix for both the 8" halves , then multiplied it up so that the 10" was 2 egg mix in each half, 13" had 3 egg mix for each quarter, then the 16" had 4 egg mix for each quarter. I'll give the basic 2 egg mix below. I multiplied up the ganache recipes in a pseudo-mathematical exercise with lots of areas of circles that just meant I ended up with far too much, but that isn't too much of a chore! We've had plenty of dinner parties since - my best friend is staying in town for a week - so we've just been serving up offcuts of the cake with the rest of the ganache and chopped up pears or strawberries and more cream and ice cream. I've melted some of the ganache down with a little more cream to pour it over the fruit and ice cream too. I'm just experimenting with freezing it too. I was feeling very happy about my time keeping (the cake had to be picked up and taken to the club where the party was being held by 5pm) until I realised that the clock in the kitchen I had been keeping time with had stopped as the batteries had run out and it was 4:15! So I had to put the cake together in about 35 minutes. Luckily I had already got all my templates and things together and so it didn't take too long to cut out the other layers and build the cake. I switched the halves position on each half so the cake didn't just have a great split down the middle. I had some sticks in the drawer - think they might be kebab sticks - that I used to pin it all together. As I was so rushed I didn't get any photos of it being put together or the crumb coat etc. The photos at the top and bottom of this post are of the cake being lit at the party and were taken by the photographer we hired, Thomas Roulin at Alpimage. I have to admit I turned them into black and white. I wish I had had time to take more myself! Preheat oven to 170C and line two 8" tins with greaseproof paper. Cream butter and sugar until pale and fluffy. Add an egg and a tbsp of flour and mix, before following with the other egg and more flour. Beat in well. Sift in the rest of the flour, baking powder, cocoa, hot chocolate powder and salt. Fold into the mix lightly - the mixture will be dry and almost flakey. Add the milk and fold again quickly - it should soak up most of the dry bits, but don't worry too much - it's a fairly lumpy mix. When you are totally ready to whip it into the oven, measure in the boiling water and fold in the water - it will seem like lots and swill around but it will mix in. Quickly transfer into tins and into the oven and bake for around 25-30 mins or until a skewer comes out clean and it is springy to touch. Cool on a rack. 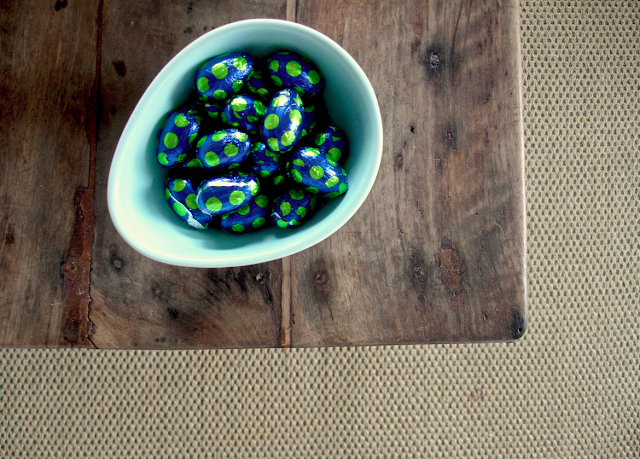 Break the chocolate up and put in a bowl. Measure out and heat creme fraiche and cream in a pan on a medium heat till nearly boiling. Pour over the chocolate and leave for a minute before stirring until smooth. Chill in the fridge for around 2-3 hours. Chop up the chocolate into half-squares and put in a bowl. 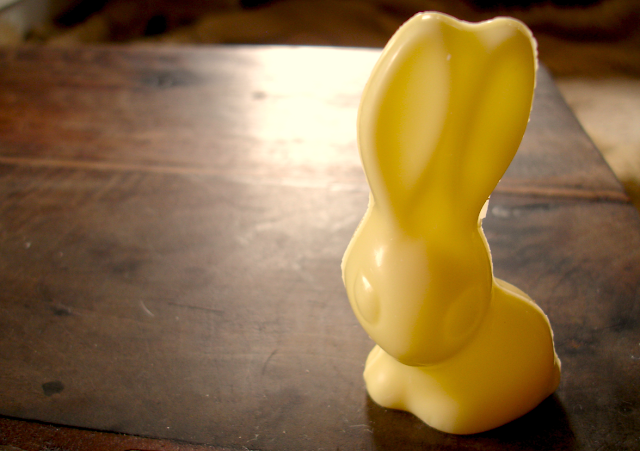 Heat cream and pour over the chocolate. Leave for a minute and then stir. When smooth leave to cool - but don't put in the fridge. Every year my mum has a huge birthday party (think a guest list of 500...) and I bake the cake. 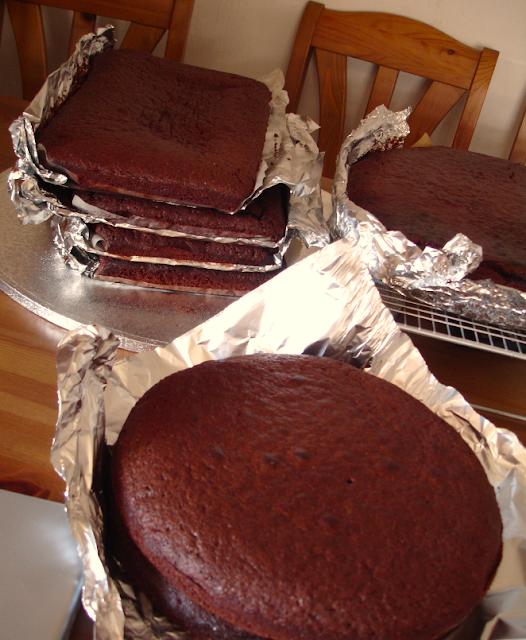 So tomorrow will be a bake-a-thon of sorts, as I'm baking the whole four tier 16 inch extravaganza while mum is out in the day before the party at night. Hopefully it won't take as long as last year, I was exhausted by the time it came to the party and by 4am I was definitely flagging! So I thought I would make some of my favourite Ginger Oats yesterday to keep me going while I did all the calculations for scaling up the cake mix and the filling/icing and while I finished one of my holiday essays this morning. 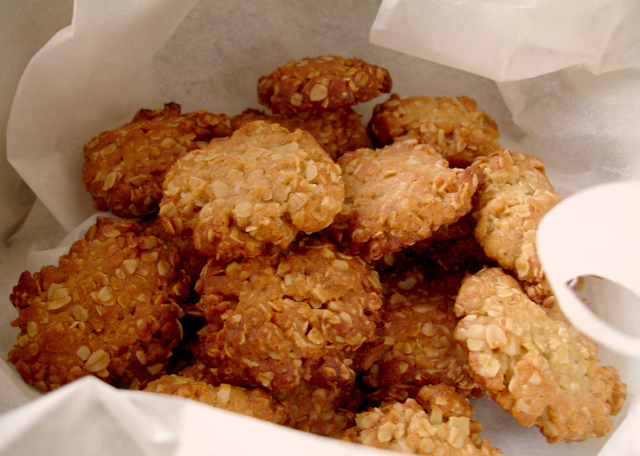 The Ginger Oats are lovely simple biscuits and take no time to knock together. 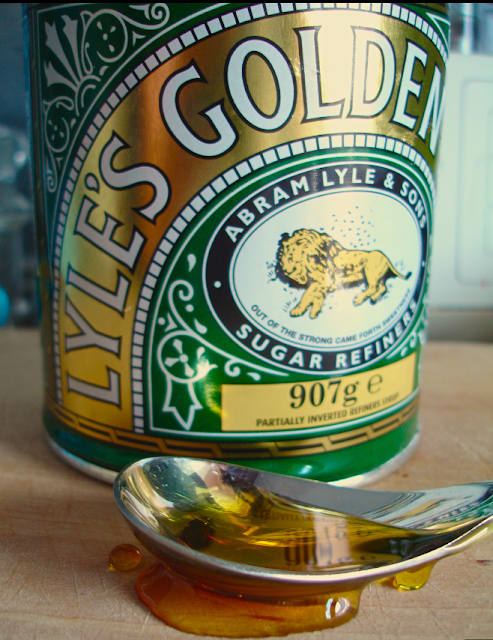 They use the divine Golden Syrup, as above. I'm not sure about worldwide availability - I know I have to bring it to Switzerland from the UK. It's basically solid sugar and such a beautiful colour - when it's in the tin it's this lovely russet/amber/red gold. 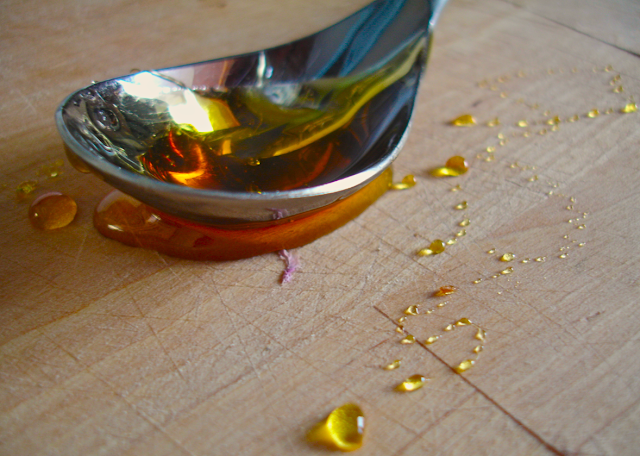 It always reminds me of my childhood - scooping the syrup out with a spoon to dollop into a cake or biscuit mix and then getting to lick the spoon. I love it on drop scones (bit like american pancakes) with butter, too. If you couldn't find it I suppose honey could work, or just more sugar - perhaps muscavado rather than more demerara to give a background flavour rather than more crunch. For the oats I had to use porridge oats as we didn't have any Jumbo in the cupboard, but they're lovely with a mix of the two or just Jumbo. Preheat oven to 170C. Heat the butter, sugar and syrup together in a pan till butter is melted. Sift flour into a bowl and add oats and ginger. Mix well. Pour the melted mixture in and mix in well. 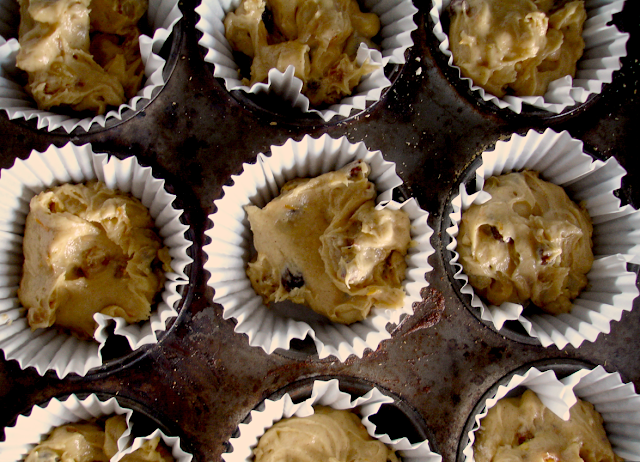 Roll small balls of the mixture in hands and place onto a greased baking sheet. Squish slightly with your fingers. They don't spread too much but give them a bit of space. Bake for around 10 minutes or until browned. Transfer to a wire rack and cool. I first made this tart for an ex-boyfriend of my mum's birthday party we were hosting last summer. It was one of the first times I had a real 'wow' moment with something I had made, so definitely holds a special place in my heart. The party guests seemed to enjoy it too - it dissapeared within minutes - including one friend of his polishing off three slices. I have to admit that both mum and I had been secretly hoping for leftovers, and weren't too amused! But after all food is made to be eaten and it was lovely they enjoyed it so much. I had been dreaming about making it again ever since but never really got around to it. Then mum decided to have a small dinner party for her birthday to counteract the huge party she's having on monday - to have time to actually chat to friends - and so I thought it was time I made it again. It didn't quite live up to my memories but I'm blaming that on not having lovely in-season home grown raspberries and only having medium quality white chocolate. It was still very lovely. Luckily this time we had plenty leftover - think it was more due to over-feeding them with the previous courses than any fault of the tart (or perhaps this was a scheme to keep some...!). It's really very rich and decadent so not too much of a surprise we couldn't manage huge slices. It was rather helpful we had some leftover, actually, as I had forgotten to take any photos of the finished product the night before. I had a lot of problems with the pastry base this time - I don't remember it being a problem before. In the end I had to make two - the first went wrong in every way possible. To start with it never looked or tasted quite right, then I tried to make it fit a slightly bigger tart tin so it was handled too much as I tried to patch it up/stretch it, I didn't have proper beans to bake it blind so used rice which stuck and wasn't heavy enough, then the sides started breaking off as I tried to get the rice off... and then to top it all off, I managed to burn it. So the dogs enjoyed that one with their supper and I set to making it again. I increased the cocoa and sugar content and made it by hand rather than in the food processor, which seemed to improve the feel of the dough. My fridge wasn't cooling properly - think I had stuffed it with too much stuff for the rest of the party - so I popped it in the freezer (which is always fairly tepid itself - can hardly keep ice cream solid) for two thirds of the time it needed to rest. 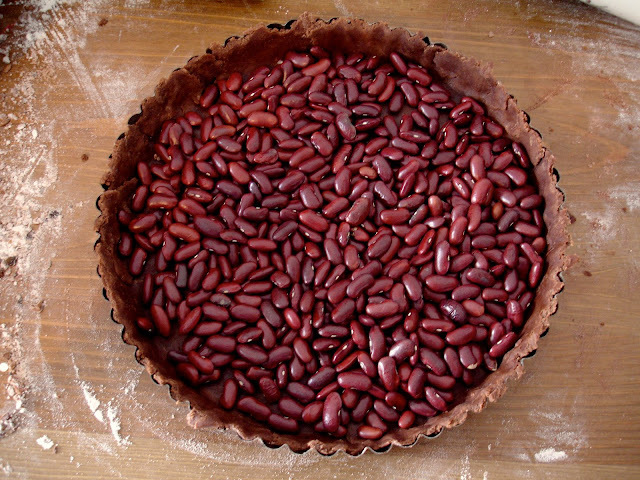 I went and bought some proper beans (as you can see above) and used the proper sized tin and it turned out much better. I've written below the method/ingredients I used the second time. I would still like to play with the pastry recipe - it wasn't as tasty as I remembered.